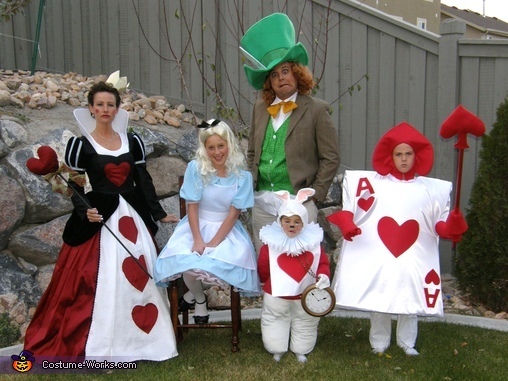 Alice in Wonderland Characters - great costume idea for a family! Queen Of Hearts, Alice, Mad Hatter, The White Rabbit, and the Ace of Hearts card. This homemade costume for families entered our 2011 Halloween Costume Contest. These costumes are fabulous! I am a photographer and have an upcoming Alice in Wonderland session. Would you be interested in selling these? Or any interest in being hired to make others like them? I am trying to make this rabbit costume for my son. How did you do the neck piece? would love to purchase..do you make these? Hey! Do you still have these costumes? If so would you be interested in selling them? Can you make me a "Red Queen costume"? Did you use a pattern? Hi i make some of my own costumes but nothing as nice as this it is fantastic I love them all. Please can you share the patterns ideas for them all with me thanks. I would love to purchase some if your making?